The opening weekend of the NBA playoffs is in the books. The Celtics and Rockets coasted, the Sixers and Raptors struggled, Damian Lillard outplayed Russell Westbrook, and after 48 hours, the entire league has come to back to life. Here are 10 takeaways from the weekend that was. 1. The Process is on the brink of a crisis. The Sixers opened the playoffs looking flat, slow, disjointed, and ordinary. The Nets won Game 1 111–102, obviously—led by 26 points and a huge second half from D'Angelo Russell—but the outcome was only half the problem. The optics of Game 1 were even worse than the loss itself. 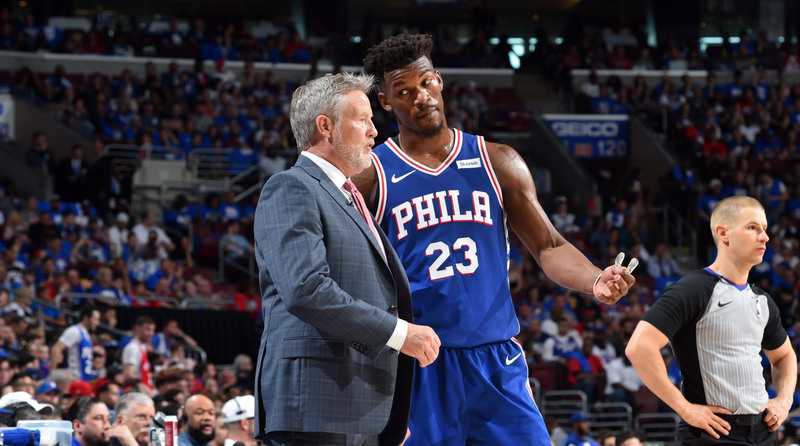 All the nagging doubts about this Sixers blueprint were not only realized on Saturday, but they were magnified and impossible to ignore. Joel Embiid didn't look healthy at all and he played one of the worst games of his young career; Ben Simmons still won't shoot and still doesn't complement Embiid; Tobias Harris was 2-of-7 from the field and you barely noticed he was on the floor; J.J. Redick struggled on offense and was repeatedly targeted on defense; Jimmy Butler was fantastic on offense with 36 points on 11-of-22 shooting, but half the appeal of Butler is rooted in his defensive impact at the point of attack, and the Sixers remain completely lost when it's time to guard a semi-capable point guard in a pick-and-roll. It's true that Saturday afternoon was only one game in what will probably be a long series. Philly was 3-of-25 from three-point range and shot 69.2% from the free throw line on 42 attempts, while the Nets shot 42% from three and 92% on 26 free throws. There's plenty of room for the Sixers to improve and take control of this series over the next two weeks. But Game 1 was the sort of lifeless performance that'll be difficult to shake when it's time to think harder about what this team has and where it can actually go. Embiid's health and conditioning issues aren't going away. Simmons remains shockingly passive in big moments. The Sixers traded two first-round picks and two second-round picks for Harris, a player who may never make an All-Star Game and isn't guaranteed to re-sign in Philadelphia this summer. Butler can take over games for long stretches, but we still haven't seen him do it within the context of the Sixers offense. He's a free agent, too, and whoever pays him will do so knowing on day one that the second half of his contract will be losing investment. When Game 1 was over, it was hard not to grimace at just how much has changed for this team in the past 12 months. A year ago the Sixers were busy tearing through the entire league and they looked like Finals favorites who were well-positioned to own the East for years to come. A year later they have gone all-in on an All-Star team that only has two All-Stars, and the team that was once infamous for stockpiling lottery picks just lost a playoff game to a team that hasn't used its own first-round pick since 2012. The stakes for the Sixers have been clear all season, but Game 1 was a reality check as to just how perilous this plan really is. After cashing in years' worth of assets for one-year experiments with Butler and Harris flanking Embiid and Simmons, a loss to the Nets really isn't out of the question. That alone is an indictment of how this team has handled the past six months. And if Game 1's loss does eventually turn into a first-round exit, that outcome would be a full-blown disaster that reflects terribly on players, coaches, and executives. Everyone in Philly understands that much. Now we'll see how they respond. 2. Sunday was Paul George's best MVP argument. George was lights out for the first two-thirds of this season. He shot the ball like the third Splash Brother (28.7 ppg, 40.6% 3FG on 9.6 attempts per game), and OKC was 37–20 headed into the All-Star Break. Since then George is shooting 33.6% from three, he's battling a nagging shoulder injury that rendered him a game-time decision Sunday, and the Thunder are 12–14 since the All-Star Break. On Sunday George was 8-of-24 from the field and 4-of-15 from three in Game 1, and as he struggled, the entire Thunder offense caved in on itself. The Thunder's defense is good enough to give them a chance in every game they play, but the flipside of building a team full of rangy athletes is that not many of them can be counted on to hit shots and space the floor in big moments. So while the easy explanation after OKC's Game 1 loss is to point to the outside shooting—5-of-33 from three-point range—it bears mentioning that most of OKC's players just aren't very good shooters. When Dennis Schroder (0-of-7 from three), Russell Westbrook (0-of-5), and Jerian Grant (0-of-3) are the ones trying to carry things on the perimeter, the story won't end well. Granted, even if George is hobbled all series long, the Blazers are shorthanded, too. This series will probably go six or seven games regardless of what the Thunder get from their small forward. Damian Lillard and Westbrook could be the single best battle of the entire first round. But if anyone is wondering what happened to OKC over the past two months and how they might bounce back to make a real playoff run, I'm pretty sure the answer is the same, and Westbrook is almost incidental. Paul George's shooting is the oxygen that allows this Thunder offense to breathe. When he's playing well, OKC can scare almost anyone in the league. When he struggles, everything becomes twice as complicated. The entire team becomes half as dangerous. 3. If you don't like huge Damian Lillard shots, why are you even here? Let's just keep it simple: Lillard will never be the best in NBA, but there aren’t five players in the league more fun to root for. Over the years we’ve watched him become one of the toughest, craftiest players on the planet, we’ve seen carry patchwork Blazers rosters for years, and there just aren’t many things in basketball more satisfying than watching him him step into big, backbreaking shots from 30 feet away. After two straight springs watching him and the Blazers swept out of the playoffs, Game 1 in Portland was a welcome reminder. All of this is a lot more fun when Lillard is around. 4. James Harden is the most demoralizing player in the NBA. Harden just finished the best season of his life, and after a career full of "But can he do it in the playoffs?" questions, he'll have plenty of opportunities to answer that narrative this spring. Step one was Sunday night, when he went out and put up 29 points, eight rebounds, and 10 assists against a Jazz defense that was largely helpless all night long. He was incredible, and he made it look easy. Watch this clip of Harden making Ricky Rubio fall, then drilling a three in his face. In addition to all the arcane stats that your average Rockets fan will try to introduce to every MVP conversation, Harden also leads the NBA in "plays so demoralizing that many opponents would consider quitting right there on the spot." Good luck, Utah. 5. D.J. Augustin saves. 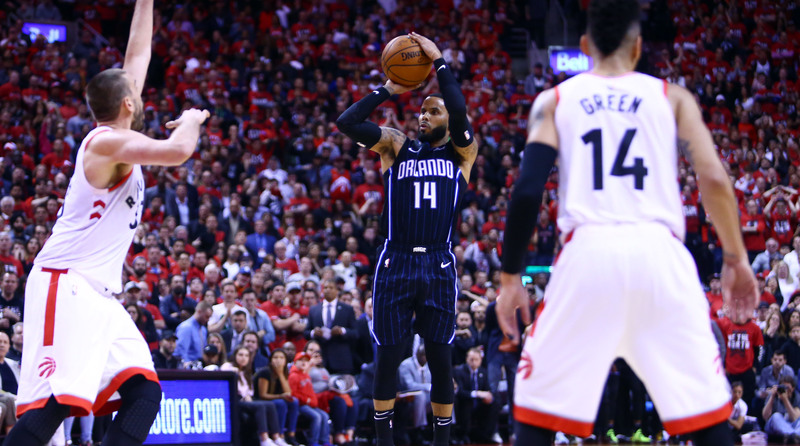 The Magic have gotten help from all over the roster this season—a career year from Nikola Vucevic, solid play from the wings with Evan Fournier and Terrence Ross, Aaron Gordon doing a little bit of everything, Jonathan Isaac coming of age—but if we're talking about surprises during this Orlando season, that conversation has to begin and end with D.J. Augustin, starting point guard. At 31 years old, on his eighth team in 10 years, he's spent the season putting together a sneaky solid line—11.5 ppg, 5.5 apg, 47% shooting, 40% 3FG—and making this work as the leader in Orlando. So as a month of "Wait, how are the Magic making the playoffs?" gave way to a wave of "WAIT, how did the Magic win Game 1? ", it was only right that Augustin was at the center of all the answers. He had 25 points, six assists, and the game-winning three on Saturday night in Toronto. Ten seasons into his career, he's doing it for Acie Law, T.J. Ford, A.J. Price, Jerome Randle, Jawun Evans and dozens of other undersized guards who tore up college basketball but never quite caught on in the NBA. Whatever happens in the rest of this Toronto series, the year of D.J. Augustin has been great. 6. Kyle Lowry, again. The logic for Raptors believers makes sense—they have the most lineup versatility, good depth, decent coaching, and a superstar who has spent so much time resting through the regular season that many fans around the NBA may have forgotten exactly how dominant he can be in a playoff setting. All of that is still true after Game 1. But Kyle Lowry in the playoffs has always been asterisk next to all these Raptors-as-real-contenders arguments. He's struggled on the playoff stage for several years now, his explosion isn't what it used to be, and after Saturday's Game 1—0-of-7 from the field, 0-of-6 from three—I'm not sure how much more needs to be said. I've always enjoyed Lowry and I hate that we have to have this conversation every spring, but the questions are unavoidable after a game like Saturday. The Raptors can probably beat the Magic without Lowry at his best, and they could maybe beat the Sixers, too. But to beat Boston or Milwaukee, and to win anything that really changes the perception of this team, the Raptors need Lowry to be much better than he was this weekend. 7. We won't learn anything about the Celtics for another two weeks. Did Boston actually play well on Sunday, or did they just play the Pacers? I'm really not sure. The Celtics have driven themselves crazy for seven months, they remain the most inscrutable maybe good team in the NBA, and after watching Game 1 against Indiana—awful first half, dominant second half—I'm not convinced we'll have any more insight until the second round. The Pacers don't have enough firepower to capitalize on Celtics weaknesses; Boston can play a deeply average game and still beat Bojan Bogdanovic and Thad Young by double digits. So with all due respect to the Pacers, I recommend we reserve judgment on Celtics breakthroughs, season-saving, corner-turning, switch-flipping, any kind of airplane bonding sessions, all Marcus Morris quotes, and everything else that has led us astray at other points this season. We'll learn more about Kyrie and the Celtics when they play Giannis and the Bucks. Until then, proceed at your own risk. 8. The Nuggets, on the other hand, are about to find out what they have. 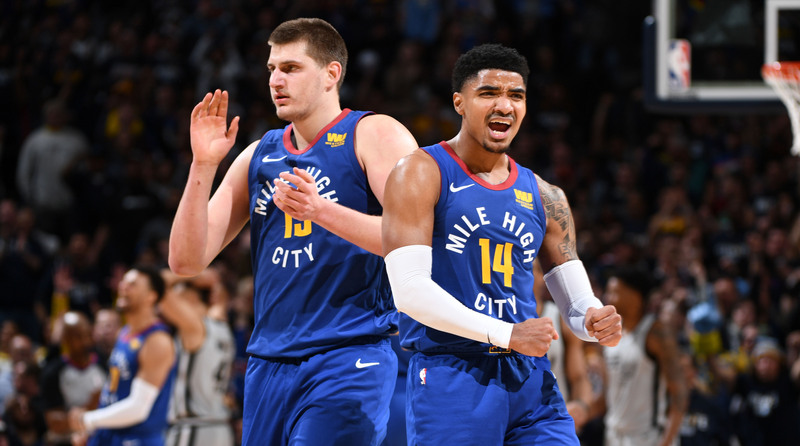 The Nuggets didn't shoot the ball well in Game 1—3-of-22 from three-point range through three quarters—but they were in position to win at the end, and nobody could get it done. Nikola Jokic had a chance at a go-ahead bucket that he promptly fumbled into the hands of two Spurs defenders, while Jamal Murry gacked at a wide-open look at a go-ahead jumper in the final 10 seconds. After two Spurs free throws put San Antonio up three, Murray followed that miss with another turnover to seal the loss on the final possession. Anyone who wants to chalk that loss up to shooting variance is underselling how close the Nuggets were to winning anyway, and how lost they looked when it was time to close. What follows, now, will be an interesting test for a team that's still younger than almost anyone else in the playoffs. San Antonio is a good matchup for Denver. This series is very winnable. So can Murray respond after going 8-of-24 in Game 1? Can Jokic score more than 10 points? And how will they use Will Barton and Gary Harris? What about Paul Millsap? If the Nuggets can weather this storm and find a way to handle San Antonio, they'll have a decent shot at beating the winner of the OKC-Portland series. It would be great experience for the young players and pushing toward the Conference Finals would solidify this season's progress in the eyes of everyone around the team and the league. Or, if Murry continues to falter while the rest of the supporting casts wilts, that could be a different sort of message for the front office planning the future around Jokic. 10. These games matter again. People who complain about the lack of intensity during the NBA's regular season are generally wrong (and always insufferable), but there is about one month per year when they are indisputably correct. Every year at the end of the season, the NBA descends into this haze of superstar rest, rampant tanking, contenders going half-speed, and fans and media arguing about people like Devin Booker. It's terrible. And now, officially, that phase of the season is over. The playoffs weren’t perfect this weekend, but half these games came down to the wire, and all of them were worlds better than the past month in the NBA. We have real things to argue about now, and starting Monday night in Philadelphia, all of this drama will begin to multiply. Enjoy it.